Daddy read a modified version of the story out of our My First Message: A Devotional Bible for Kids. All throughout the week we have been reading from the regular NIV each morning to get the full story ;-). We are making a 10 commandment train together… After coloring the boys were surprised with the complete set of these DVDs all about the 10 Commandments. Krash is in LOVE with his “Moses Movies” and has watched them as much as I will allow since getting them! There are 5 in the set. 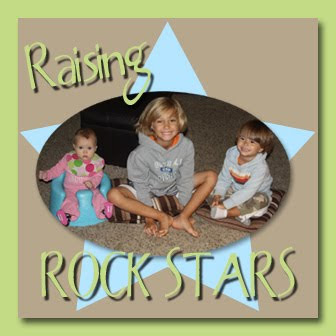 Visit theRaising Rock Stars Webpage to download your own notebook pages and to see links to previous Rock Stars posts! Tot School ~ Spring Fun…Kites!